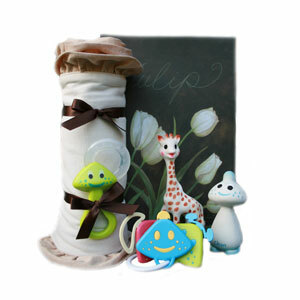 Exclusive to GrowInStyle, our Organic Little Teethers Baby Gift Box is the perfect gift set for little hands and mouths. Made with the most popular Vulli teethers, including Sophie the Giraffe, the most loved all natural teether, our set is guaranteed to be the safest non-toxic baby safe teething set available. Beautiful gift box made with recyclable paper - a gift on its own, perfect if used as a keepsake box. Organic Baby Gift Box - "Save the Planet"